Dimensions : 126 H x 55 W x 48 D cm. Seat height : 47 cm. 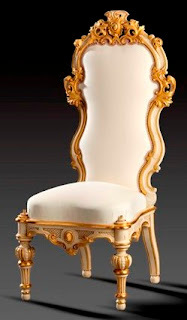 This Antique Italian Style Venetian baroque chair from the 19th century, inspired by the early Northern-Italian baroque style as well as the neo-classical style from the XVIIIth century, shows us the excesses of a daring and frivolous style. 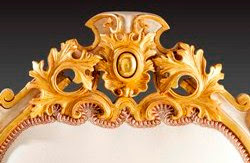 Its high back, majestically carved with acanthus leaves seems to belong to a “chauffeuse” (low fireside chair). Nothing is less true, however, since the seat allows the chair to be placed around a dining room table and it will stand out as an architectural element. The style of this chair can be combined with a refined as well as a luxurious setting.